NOW Real Food Citric Acid Powder is a natural preservative that helps to inhibit the formation of mold and other bacterial growth, an all-too-common occurrence when sprouting in a jar due to high temperatures and humidity. If you’re into sprouting, then you’re already familiar with Citric Acid, a natural preservative typically found in citrus fruits such as lemons and limes. Citric Acid is also useful for canning vegetables and fruit preserves. Because you are what you eat, NOW Real Food has been committed to providing delicious, healthy, natural and organic foods since 1968. They're independent, family owned, and proud of it. Keep it natural. Keep it real. 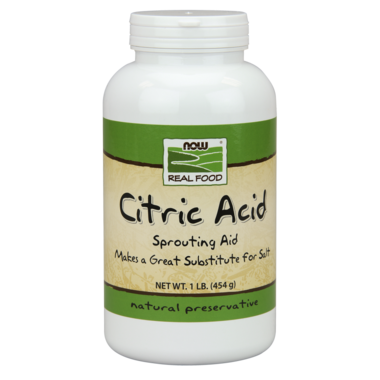 Citric acid can be used to reduce spoilage in sprouting by adding 1 tsp. per quart to soak and rinse water. 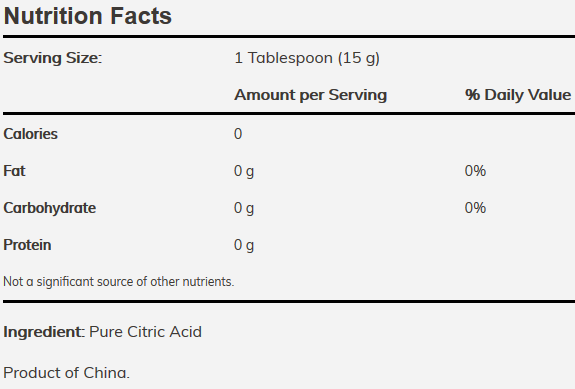 Citric Acid is a food grade acid that is present in many natural foods. Citric Acid is also useful in canning, drying or freezing foods. It can be used to preserve Vitamin C content, retard spoilage and prevent discolouration. Use 1 tsp. per quart of water or juice for most fruits and vegetables. Store in a cool, dry place after opening. I purchased this after reading Citric Acid was recommended to clean our humidifier of scale build up and it worked amazingly. A cloth with regular warm water did nothing to remove the build up but after adding a small about of this powder it stripped it clean and like new. Used to make bathbombs. Works great! we've been making our own bath bombs and this works great. I put this in my dishwasher along with the dish soap and it prevents hard water stains on the dishes. Happy that I can rest assured that my sprouts will be safe to eat! Good quality ; I was able to make a variety of diy cleaning products . I have nothing wrong to say, aside from the fact that the price is a tad high for the quantity. I got this to make bath bombs. Works great! !